Leftover cake scrapings, apricot sauce and whipped cream, so simple yet so comforting and delicious. I should have posted yesterday, however I did not manage. I am kind of struggling today as well, I am not sure what to say, I am kind of numb and exhausted and so sad. We (my husband, one of our best friends and I) had such a shattering experience on Monday evening, we have still not recovered, we are still under shock, I would say. Yesterday was spent in some kind of a haze, trying hard not to think about it and failing completely at it. My thoughts are with the families and friends of the two young men and I just hope that the second one will make it. So, I really have no more words today, just a small and simple recipe. If you have made the Apricot Sauce I posted last week, this is a great way of using the leftovers. If you have another compote or fruit sauce in the house feel free to use that. As for the crumbles, they are just leftover cake scrapings. I bake a lot, including more elaborate wedding or birthday cakes and I always have leftover scrapings in my freezer. This dessert is a great way of using them. If you don’t have any cake scrapings you could make My Best Base for Fondant Cakes (my scrapings were leftovers from this particular cake as well) or you could use a ready-made cake. The quantities are not an exact science. Use the scrapings you have and adjust the fruit sauce quantities accordingly. I had about 4 cups cake scrapings and used about the half quantity of the Apricot Sauce from last week. 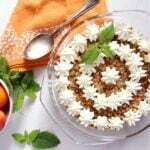 Whipped cream is only used for garnishing the dessert, so 1 cup should be enough. The inspiration for this recipe came from an old Romanian newspaper cut from 1938. Make the Apricot Sauce. 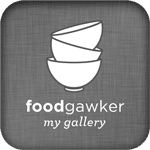 You can use another fruit sauce or you could thicken any fruit compote and use that instead. 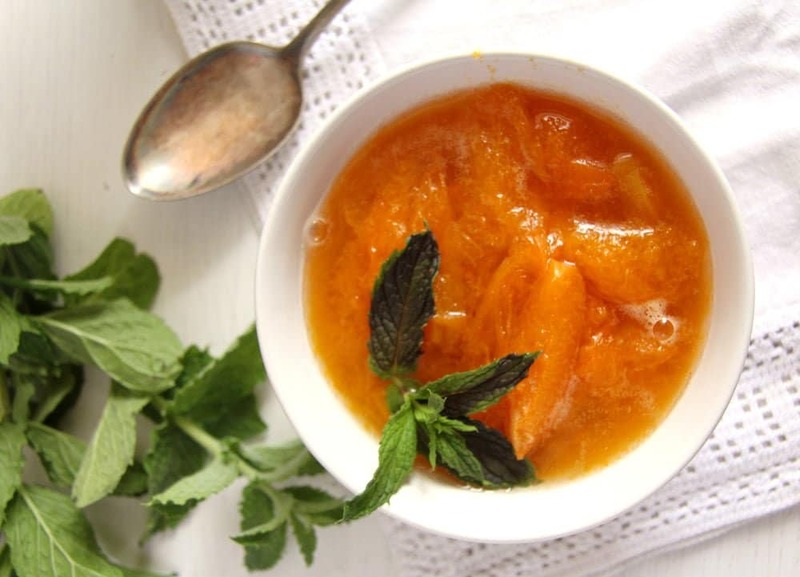 To make apricot sauce from a can of apricot compote, bring the juice to a boil and thicken with 1-2 teaspoon corn starch mixed with 1-2 tablespoons cold water. Let cook for one minute or so and stir in the chop or sliced fruit. Crumble the cake scrapings with your hands. Melt the butter in a large pan, give the cake crumbles to the pan, sprinkle with the sugar and toast, stirring often, for about 8-10 minutes or so, until they are fragrant and not so soft anymore. Let cool. Butter a small serving dish or casserole dish. 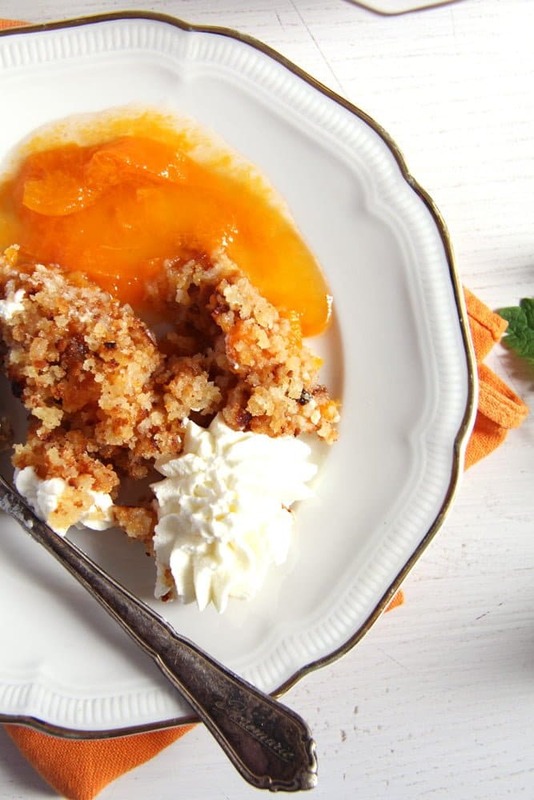 Start layering the cake crumbles and the apricot sauce , finishing with a layer of crumbles. The apricot layer should be more or less as thick as the crumble layer. In the end I had 3 crumble layers and two apricot sauce layers, if you have more ingredients just make more layers. Chill the dessert for a few hours. Whip the cream (no sugar necessary) and garnish the dessert just before serving. Great use of cake scrapings! It looks scrumptious. 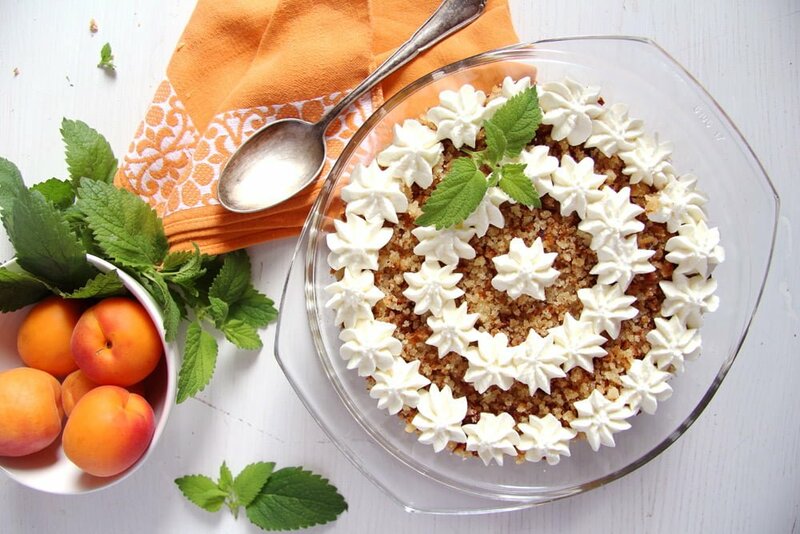 On a lighter note, your apricot crumble looks wonderful! What a great way to use leftovers! As for this delicious crumble – it’s the perfect blend of flavors and textures – simply delightful! i’ve never been in a situation like that but i’m sure it would leave me shaken! 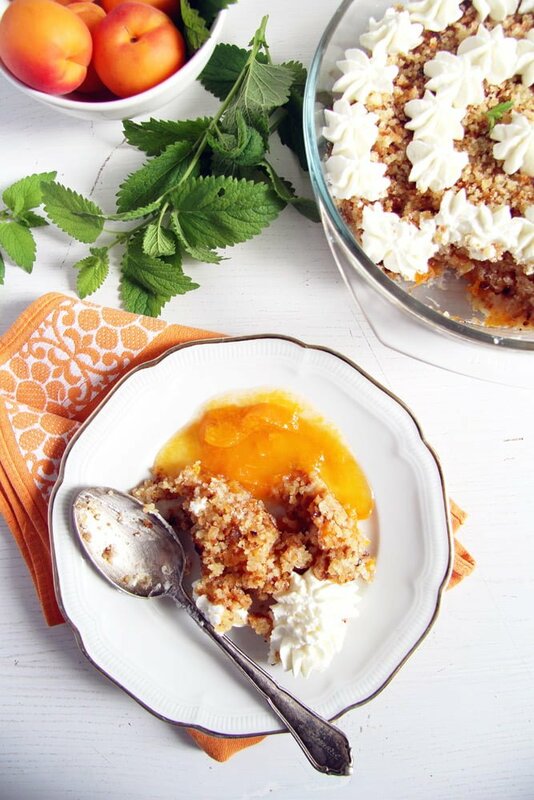 i love this dessert–crumbles are my favorite fruity treat! Excellent idea to use cakes’ leftovers. I always make a crumble from the scratch, but I never count ingredients’ amounts (this is why I love it: no weighing, no counting…). Your crumble looks and sounds delicious. I’ve never been in such a situation… seeing closely someone who has just died in an accident, but I’m sure I’d be shaken like you. We tend to forget sometimes that roads are so dangerous…. Apricots do not get enough love! I always forget how wonderful fresh apricots an be and in a crumble? Ah, wonderful!